After watching a few inspiring videos on calligraphy, buying the Pilot Parallel Pens, I got really inspired to learn calligraphy. 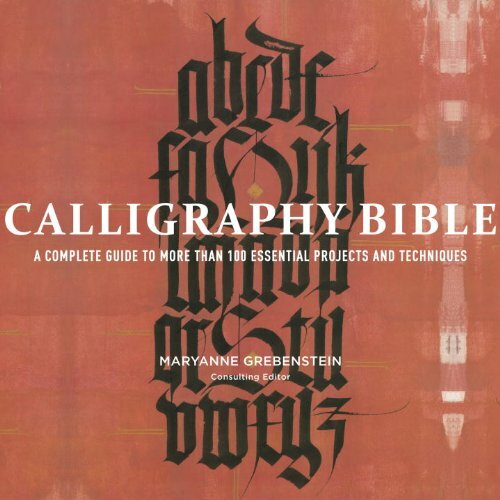 I found this book called the Calligraphy Bible published by Watson Guptill to improve on my non-existent calligraphy skills. This is a great book for beginners. The book's split into several parts. The first covers the basics which includes introducing you to the materials required, basic holding and writing techniques and understanding calligraphy letter form. The materials used are dip pens but fountain pens with calligraphy nibs will work as well. There are also hints for left-handers. Each of those styles come with a brief history, the alphabet chart, variations of the style and a few empty ruled pages for you to practice on. The letters are accompanied by arrows that tell you how to move your nib, and the angle to use. It's very easy to follow along. When you run out of pages to write on, you can draw your own rules, and that is taught as well early on. Next up is the fun section about design and colours. This section shows how calligraphy can be used for art and design. There are techniques to learn, tutorials to follow. The part I like best is on mixing colours to write letters that have colour gradations. The fourth section goes into more decorative techniques. You'll learn how to create those beautiful cursive strokes, draw ornaments, borders and other artistic techniques. The last section builds on what you have learned so far. This section consist projects with step-by-step instructions and covers the use of calligraphy for actual work, such as to create a letterhead, wedding invitation, poster, elaborate letters and more. It's very inspiring to look at all the examples and the beautiful gallery that follows. The book's 256 pages and is really worth the money for any calligraphy beginners.